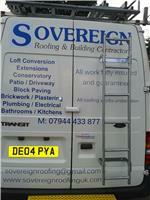 Sovereign Roofing And Building Contractors - Builder, Fascia/Soffits/Guttering, Roofer based in Twickenham, Greater London. Sovereign Roofing and Building Contractors are a local, traditional family run professional company covering a wide variety of projects ranging from small repairs to new developments. All our work is carried out in the same professional manor with no job being too big or small. We were founded in 1976 and have over 35 years’ experience in all aspects of roofing and building and have a large client base. Feel free to give us a call or come and visit us on one of our local jobs! •GRP flat roof repairs 30 years warranty. •Cabin installing, shed installing Plastic, wooden, Metal instalments, Custom Made Cabins to your requirements. •New Boiler, Radiators all aspects of plumbing! We believe all our feedback speaks for how our company is run.